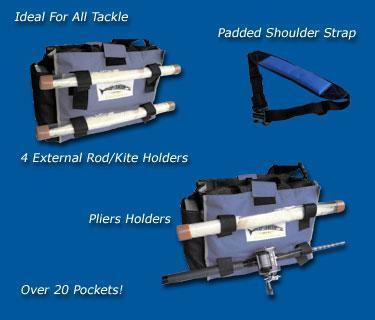 The T-1 Tackle Bag designed by the team at Deep Blue Marine features everything you need in portable tackle storage. 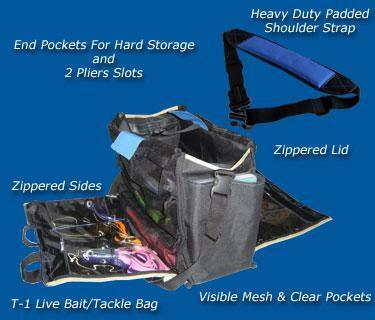 Zip down sides have both clear and mesh pockets for easy access, outside pockets fit plastic tackle trays (available seperately) as well as other multiple uses. Pliers/snap ring tool holders are also on the outside for easy access. Inside is room for more hard plastic trays and/or a multitude of other items. All heavy duty stiching with a padded shoulder strap for carrying all of your items. The lid features a clear "Passport" pocket and zippered pouch for convenient accessability. Doubles as an overnight travel bag for those quick trips. 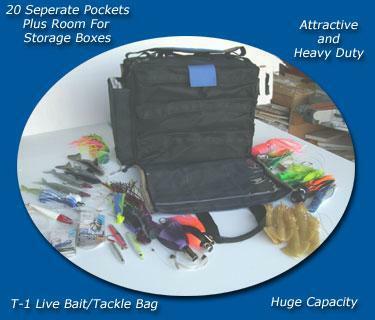 The tackle pictured fit in ONE side of the bag and of course, is not included.